Welcome to the first Screen Plays blog post of 2014, the last full year of the Screen Plays research project. John and I will be spending a lot of time this year creating detailed database records for the 3000+ British television productions of theatre plays that are known to have been transmitted. There is so much of potential interest that we must necessarily skip lightly over during the information gathering and data entry processes, just to make sure that we cover all the necessary ground before the database is published online in 2015. It is a shame, however, not to flag up some of these potentially interesting productions, both for ourselves – topics for future research, perhaps? – and for our readers. One of my new year resolutions is, therefore, to post shorter and more frequent blog articles on productions which have caught my eye but which I don’t presently have the time to research in depth owing to my other research and writing commitments. I shall start off the new year by registering a few thoughts arising from the 1959 Granada production of The Younger Generation by Stanley Houghton (1881-1913) which I have recently added to the database and which John and I watched together last week as part of John’s preparation for programming the BFI Southbank season of Edwardians plays on British television. Houghton, one of the Manchester School of dramatists whose work had regularly premiered at Annie Horniman’s Gaiety Theatre in Manchester, is best known for Hindle Wakes (1912). 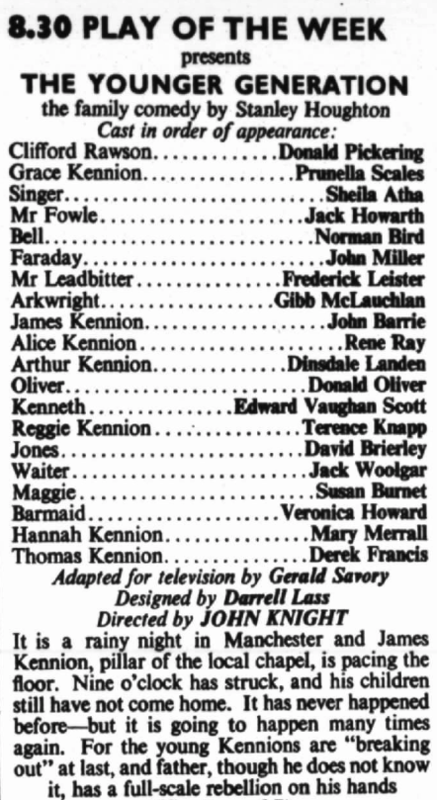 Whereas Hindle Wakes was produced at least four times on television (BBC, 1947, 1950 and 1957; Granada for ITV, 1976), The Younger Generation seems only to have received the one production in 1959, directed by John Knight for ITV’s Play of the Week series. 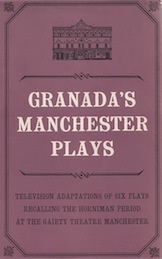 As John has outlined in his blog post on Granada’s Manchester plays, Houghton had an important place in Granada Television’s project to adapt and produce many of the plays of the Manchester School first produced at the Gaiety half a century earlier, ‘both as celebrations of regional identity and as precursors of contemporary writing by authors such as Arnold Wesker, Alun Owen, John Osborne and Shelagh Delaney’. The Younger Generation, subtitled A Comedy for Parents, premiered at the Gaiety in 1910, a time as yet untroubled and unshaken by the world war soon to come. It is a gentle comedy portraying generational conflict in a pious, supposedly teetotal, middle-class family in Salchester (a Manchester suburb derived from combining Salford and Manchester). The three children of the family are now young adults in their late teens and early twenties: the eldest, Grace (played by Prunella Scales in the Granada production), has found the man she wishes to marry (Clifford, played by Donald Pickering) and they frequently spend time together alone, in secret; Arthur, played very convincingly by Dinsdale Landen, works in a bank but longs for a more interesting and exciting life; and the youngest is Reggie (Terence Knapp) who dreams of giving up the secretaryship of the Sunday School and emigrating to Canada to live ‘a man’s life’. 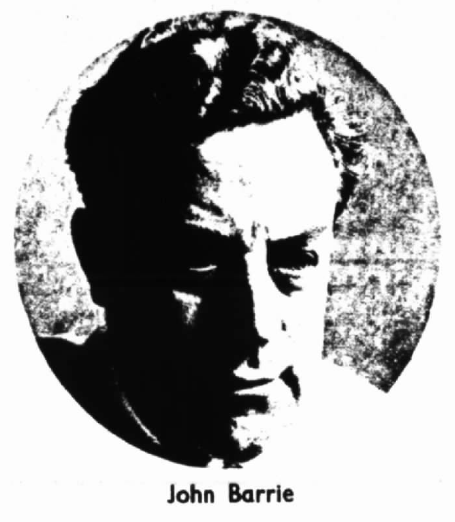 Their parents, especially James Kennion (played by John Barrie: see portrait shot from the TV Times adjacent, and the listing above for the rest of the cast), have too little confidence in their own upbringing of their children and attempt to maintain too tight hold on the parental reins as their children begin navigating adulthood. Other perspectives on this tussle are offered by Uncle Tom, brother to Kennion, who privately reminds him of the drunken larks they shared as young men; Mr Fowle, a Councillor of the Liberal Association who approves of Kennion’s abstinence for political purposes, even if he doesn’t go in for it himself; and the Kennion brothers’ own mother, who has clearly ruled her sons with a rod of iron. The play’s comic potential lies in the concentration of all three young adults deciding, independently, to break out from their parents’ strict grip at the same time: all of a sudden, they gain the confidence to say what has hitherto been the unspeakable and demand the unthinkable, leaving their parents baffled, alarmed and reactionary. Neither the original play nor the television production seem to have created much of a critical splash. The nearest thing I’ve come across to a review of the television production is a note by Maurice Richardson to the effect that he had wanted to watch it but the BBC’s adaptation of Elizabeth Bowen’s 1935 novel The House in Paris was just too absorbing to allow him to change channel (‘Knocking Copy’, The Observer, 6 September 1959, p. 22). One can imagine that this was a nicely diverting Tuesday-evening entertainment for the Granada audience (although what that audience, which was spread across Lancashire, Yorkshire, Lincolnshire, Derbyshire, Nottinghamshire and North Wales thought of some of the ‘northern’ accents assumed by the non-northern players remains to be discovered). What has stayed with me some days after the viewing is signalled by the words ‘Adapted for television by Gerald Savory’ which appear in the opening credits of the production and in the TV Times listing for 1 September 1959 (reproduced here, above). 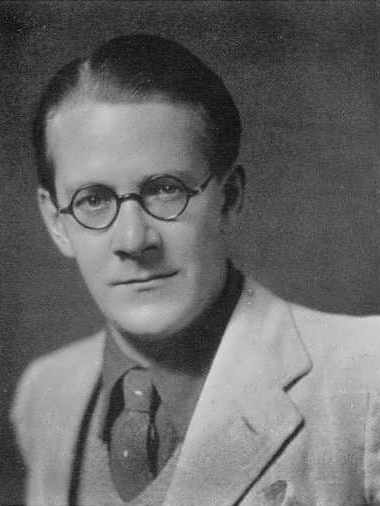 Gerald Savory (1909-1996) was himself a playwright (responsible for the 1937 West End hit George and Margaret, for example) who worked extensively as a writer and producer for both Granada and the BBC through to the end of the 1970s. Savory’s adaptation of the theatre text for television was striking: he stays broadly true to the spirit of the rather ploddy linearity of the plot but embellishes it substantially, inventing moments and even scenes in order to make the bones of the play come alive more vividly on the the 1950s small screen. The script of the television adaptation is, wonderfully, published in the volume Granada’s Manchester Plays: Television Adaptations of Six Plays Recalling the Horniman Period at the Gaiety Theatre, Manchester (Manchester: Manchester University Press, 1962), alongside Houghton’s Independent Means, Harold Brighouse’s Vitriol and Fiddlers Four, and Allan Monkhouse’s Mary Broome and The Girl in the Window. But not only this. It is true that mere suggestions in the theatre text become ‘fleshed out’ for dramatic and comic effect: for example, Reggie mentions by name his friend Jones, with whom he had shared a dinner in Liverpool, just once in the play; later, Kennion finds on the floor in the hallway a bill for their extravagant dinner which had been accompanied by a good deal of alcohol in a decidedly non-teetotal restaurant. Savory takes these two details and finds it worthwhile to have the character of Jones drop in at the house to return Reggie’s overcoat, which he had taken by accident the previously evening, in order that he might have a conversation with Kennion in which Reggie’s lie about where they dined is, to comic effect, discovered. But, as noted above, Savory is responsible for much larger expansions on the theatre text which actually deserve to be termed ‘inventions’: consider, for example, the committee room of the Liberal Association, whose councillors have just asked Kennion to stand as a candidate on the strength of his politically convenient abstinence. There is, in fact, no committee room mentioned in the play, and no scene in which Reggie arrives there, with a letter from his father withdrawing his candidacy (as a response to his children’s public behaviour being at odds with his own moral principles), only to make matters worse with his youthful bravado and garrulousness. In the playscript the councillors do not care one jot about a little youthful drunkenness and high jinks; in the television script some of them are outraged at such worrying behaviour as Grace frequenting the park with her boyfriend and her brothers drinking under their father’s encouragement (which is how Reggie depicts family life). The park is not actually mentioned in the playtext but it is realized at three separate points in the television production, complete with an attendant policemen observing the public closely and taking notes: in the very first shot we are shown Grace and Clifford sat on a bench, kissing under a newspaper; in Act 2 the park is where the couple discuss eloping; and in the final act this is where Grace is found by Reggie after she has ‘run away’. The park is therefore a structuring device in the television adaptation, functioning as a space in which hopes and dreams are built up and lost, a space which therefore physically represents the social and personal lives of the children, which are shown to be irrepressible despite the tightening of the parental reins. Similarly, short scenes are set in both Reggie’s Liverpool restaurant and the music hall bars that Arthur likes to frequent. These elaborations of Houghton’s plot adapt the play in a way which responds both to the technological possibilities of the studio where short scenes in different locations are easily shot (and therefore to audience expectations for drama) and also to the social and moral universe of nearly-1960s Britain. My last blog post, on the 1997 BBC production of Arthur Miller’s Broken Glass, touched on some of the questions that arise when thinking through the processes of adapting a theatre text for performance on the small screen. That production seemed almost to re-invent the play in terms of television, cut-and-pasting dialogue between characters, chopping up and interspersing scenes, and making intelligent use of televisual languages to underscore dramatic themes and establish interpretations. Broken Glass may have had forty more years of technological development to draw on than The Younger Generation, but we see a similar degree of freedom applied to the theatre text in the 1959 production, especially in the way it takes strands of the plot and uses them to preface to the action proper, setting up scenes, views, characters within space and time in preparation for the action to come. The 1959 Granada production of The Younger Generation, then, usefully reminds us to be alert to the different kinds of adaptation processes at work when a theatre text is produced for television. We have elements of what we may call ‘theatrical’ adaptation, by which aspects of story and plot are altered to speak more directly to the anticipated audience (such as with the relationship between Grace and Clifford, outlined above). There is also a substantial degree of adaptation in terms of the form, which responds to the technological possibilities of the studio. In addition, Savory (who was a playwright as well as a producer) builds on Houghton’s original theatre play, inventing characters, scenes and strands of plot which develop the original spirit of his play. Not only, then, does this production represent imagined (or, we might say, ‘off-stage’) spaces which exist within the dramatic narrative (the restaurant, the music hall), but it also invents relevant fictional spaces which are not alluded to directly in the theatre text (the committee room, the park), and, in addition, creates new scenes based within them, thus bringing aspects of the theatre text up-to-date for television viewers living half a century on from the original theatre audience. The intertwined processes of adaptation in The Younger Generation use the possibilities of the studio both to expand the spatial universe of the play and also to re-write the action so that the play’s themes speak more directly to the social and moral world of the audience.